Thirty youth leaders from the United Dioceses of Cork, Cloyne and Ross attended the annual CDYC (Cork Diocesan Youth Council) youth leaders’ weekend from 30th January to 1st February. It was held in Annascaul, Co Kerry. 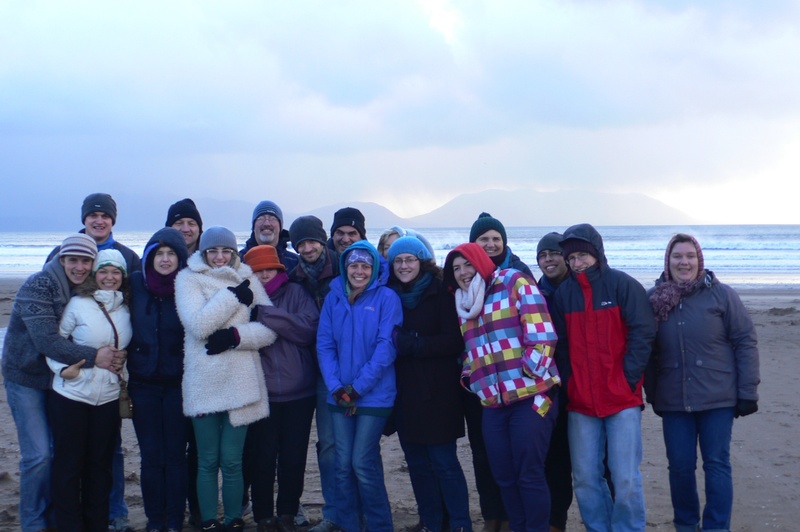 Time out from the annual Cork, Cloyne and Ross Youth Leaders’ Weekend – a walk on blustery Inch Strand, County Kerry. This year Bishop Richard Henderson, retired bishop of Tuam, Killala and Achonry, led a retreat. His talks were about the book of Jonah and he encouraged those present to reflect on its meaning for the Church today. Bishop Henderson’s teaching was interspersed with music from Taizé and silence, culminating in a celebration of the Eucharist on Sunday morning. John and Viri Kingston fed those present with gorgeous Mexican food, and the beautiful surroundings of the Kerry mountains were an ideal location. On Saturday there was time out for a cold and blustery walk on Inch Strand. This entry was posted in CDYC, Diocese, Voluntary Work, Youth Work. Bookmark the permalink.